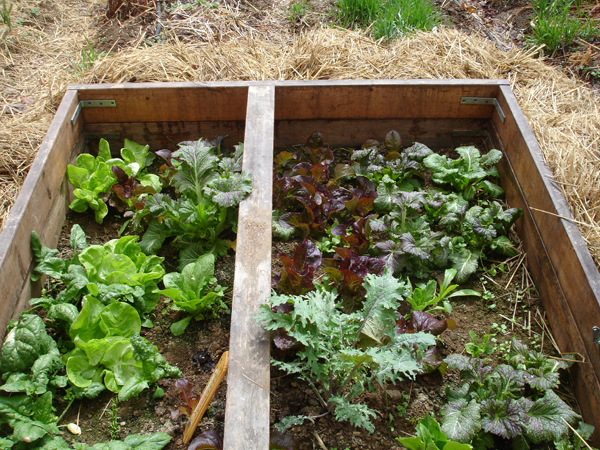 I heart my coldframe these days, and have been enjoying fresh salads from my front yard for the past few weeks already. It’s amazing how much the coldframe really took off in the last month. To make a coldframe, you just need some extra lumber, and old windows. Cedar or locust is best, because it’s the most durable, but spruce or pine are good if treated with an outdoor organic wood preservative. Some people paint their cold frames, but I think that kind of defeats the purpose of growing organically, since you’ll have paint leaching into your garden. Natural is the way to go. If you really want to make an easy cold frame, try this one using four straw bales of hay. Or, check out this video to construct one out of wood. 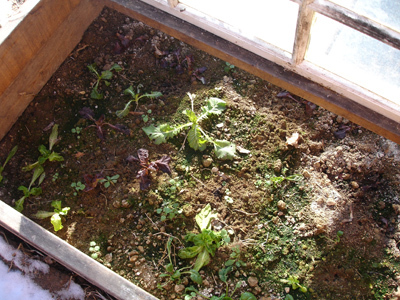 Coldframes are also a great place to harden off seedlings, and start early interplanted crops. In between my lettuces, I sowed Easter Egg radishes, Scarlet Nantes carrots and Chiogga beets. Last year, I used it to overwinter Red Russian Kale, mustard greens, Winter Bibb lettuce, Ruben’s Red Romaine, and Space spinach. Coldframe on March 29–ensalada city!